Korea, 1952. A patrol is ambushed and taken prisoner. When they return to the US, generally despised Sergeant Raymond Shaw (Harvey), who’s cursed with a busybody mother (Lansbury) and a fanatic senator stepfather (Gregory), is awarded Medal of Honor. The medal is given to him based on the testimony of his fellow soldiers, who cannot say enough good things about him, although they are unsure why. Meanwhile, a few members of the same patrol, including Major Bennett Marco (Sinatra), are troubled by nightmares in which the celebrated Sergeant kills two fellow soldiers on the command of a bunch of ladies talking about agriculture and occasionally morphing into communist leaders. Marco’s fears are dismissed by the military, and he is eventually placed on sick leave. He meets Eugenie (Leigh) on a train, and she becomes his support system as he tries to make sense of what actually happened in Korea. She is witty and fantastic, but also insanely reckless. Who talks to an unknown man who’s clearly having some sort of breakdown, and after three minutes decides to give him all her personal details? Marco’s suspicion is that Shaw, and the rest of the patrol, are all brainwashed and returned to the USA to carry out some sort of plot. But what exactly is Shaw’s mission? Who is his local handler? And will they have any chance of stopping whatever it is in time? And will Shaw ever get out from under the thumb of his controlling mother? 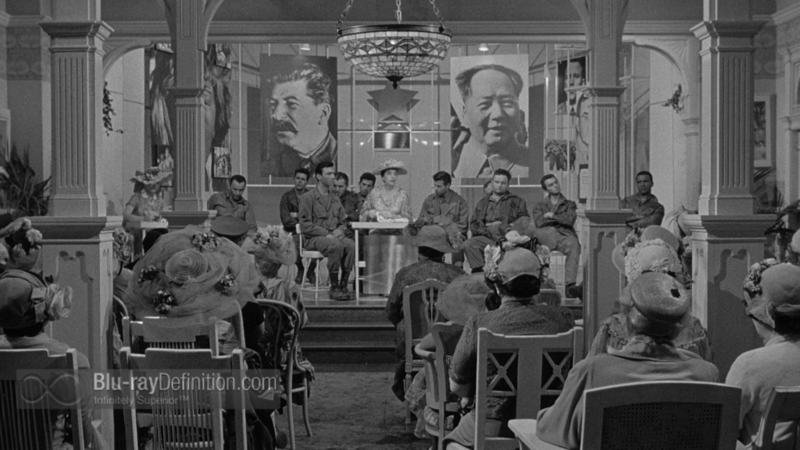 The Manchurian Candidate is a tense and compelling thriller which keeps going off in unexpected directions. We loved the horticulture talk the soldiers imagined, and the cross cutting between their perception of it and the reality. We also loved how the different soldiers saw this scene differently – the black soldier seeing a room filled with black women, etc. Now, the plot is perhaps a bit far-fetched, but in the time of the Cuban Missile Crisis and the aftermath of McCarthyism, we’re sure it hit all the right buttons. We’ll never play solitaire again! Or go to gardening meetings. What we learned: Beware the red queen! Also, what’s with all these guys meeting cool, interesting, witty women on trains?